An American flag found within the rubble of the Harveyville United Methodist Church hangs in front of where the building once stood. The entire first floor of the church was demolished, leaving only the floor of the sanctuary. HARVEYVILLE—One week after a deadly tornado cut a path of destruction through Harveyville, the town is on its way to recovery. At 9:03 Feb. 28, the town of about 250 people in southern Wabaunsee County was hit by a tornado later classified as EF-2 with wind speeds of 111 to 135 mph, injuring 14 people, including one who died the next day, and damaging at least 62 structures. Richard D. Slade, 53, died Feb. 29 from injuries after his house on the east side of Harveyville was lifted off of its foundation by the tornado. Slade was airlifted to Stormont-Vail Emergency and Trauma Center, Topeka, Tuesday night after being pulled from the wreckage of his home. He remained in critical condition and was taken off life support Wednesday afternoon; he died later that evening. Other media has reported that Slade was heading to the basement when the tornado hit his home. All other injured people were either treated at the scene or transported to area hospitals, where they were treated and released. Following the storm, the preliminary assessments by the Kansas Division of Emergency Management indicated 28 homes were not livable, including one apartment building, and 36 had moderate damage. The Harveyville United Methodist Church, in the center of town, was completely destroyed. Also, numerous vehicles in the town were battered and flung about. In Osage County, a few miles east of Harveyville, two homes and several outbuildings were damaged by high winds. According to the National Weather Service, the tornado hit the ground about one mile southwest of Harveyville and headed northeast across the town with a maximum width of 150 yards. The path ended about four miles northeast of Harveyville. The National Weather Service reported the tornado came from a strong upper level storm system that caused widespread thunderstorms across central and eastern Kansas. In all, 19 Kansas counties were affected by that night’s storms. When the tornado hit Harveyville, portions of Wabaunsee, Lyon and Morris counties had been under a severe thunderstorm warning since 8:28 p.m. Although no tornado warning had been given for Harveyville, the area was in a tornado watch. The severe thunderstorm warning cautioned that tornadoes can develop quickly from severe thunderstorms and warned citizens to prepare for large hail, damaging winds and heavy rain. During the Feb. 28 thunderstorms, Osage County was flanked by tornadoes, as another, weaker tornado hit northern Franklin County at 10:06 p.m. about 11 miles southeast of Overbrook. The northeast-trending path of that EF-0 tornado was estimated at 3.5 miles long with an estimated width of 50-100 yards. It damaged or destroyed several barns, overturned at least one vehicle and trailer, and uprooted numerous trees. EF-0 tornadoes have estimated wind speeds of 65-85 mph. That evening, Gov. Sam Brownback declared a state of disaster emergency for Wabaunsee County, activating the disaster response and recovery, and authorized state resources to expedite emergency assistance as necessary. In the daylight the morning after the storm, officials assessed the damage to Harveyville, reporting approximately 40 percent of the town was affected. Streets were blocked with debris, downed trees and power lines. Electricity and gas were shut off at main service points and impacted structures, and crews worked to restore utilities to non-impacted structures. Officials asked volunteers to refrain from going to the town, reserving the day for citizens to survey property damage and allow a full damage assessment of the town. Thursday, a full volunteer response was initiated, with volunteers told to report to nearby Mission Valley School. 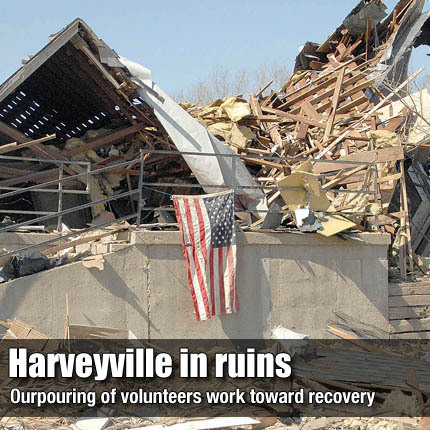 Volunteers were then transported to Harveyville, where they received work assignments and met with job site coordinators. By Friday, more than 1,000 people had volunteered. While public information officers with various involved agencies reported the town’s residents were grateful for the support, officials said the accomplishments had lessened the need for more volunteers. The volunteer center at the school was closed Monday due to students returning to school. An email address, harveyvilletornado@gmail.com, was established to field inquiries from volunteers. Potential volunteers were then contacted by coordinators, who matched them to specific needs. Saturday, so much more was accomplished that the mayor declared Sunday as a day of rest. Saturday, Kansas Division of Emergency Management reported 596 loads of debris, or 12,481 cubic yards, had been transported to a temporary landfill, more than 1,000 volunteers had assisted, 146 private contractors volunteered services, 119 emergency responders supported operations Friday, and natural gas and electricity had been restored to all inhabitable homes and businesses in town. Sharon Watson, public affairs officer for KDEM, reported that once search and rescue operations were over, volunteer offers began pouring in. Volunteer activities resumed Monday on a limited basis, with the email volunteer coordination procedure continuing. Monday also brought a need to coordinate donations of goods and money. KDEM reported that residents appreciated the generosity, but did not have resources to accept donations of property and products. In addition to other aid organizations, the city of Burlingame established a donation center at city hall and the former Kraus Hardware building, which was offered by its owner, USD 434, for use as a collection point. “Logistically we’re limited, we don’t have any place to put anything, we just don’t have much space,” said Nikol Lohr, a Harveyville resident who took over the role of public information officer as state and federal incident management team members demobilized late Saturday. When the incident management team departed, responsibility for continuing operations was transferred back to local officials. Lohr said the town’s former storage area was at the Methodist church, but with it destroyed, storage space was limited. Some personal items and food are being stored at the Harveyville Church of Christ. Burlingame City Clerk Patti Gilbert reported Tuesday that donations of personal goods have flowed into city hall, with items being transferred to storm victims and the old hardware store. She said in addition to the donation of storage space by the school district, students are also volunteering to man the donation center and load and unload items. Despite the tragedy that precipitated the need for donated items, Gilbert said the generosity of others is heartwarming. Gilbert said one person donated a new kitchen stove and numerous beds have been offered, awaiting pickup for those who need them. She said Osage County businesses also have offered assistance, especially local restaurants and grocery stores. She said local restaurants have been cooking food for Harveyville residents and volunteers. In addition, Burlingame has set up a website, http://www.helpharveyville.com, from which people can donate money. She said more than $600 had been donated since the website was established, with all of the funds going to Harveyville residents; the city will retain none of the funds for administrative expenses. In addition to public works employees from Burlingame, employees of Osage County and its cities, and emergency personnel from across the county have offered help to Harveyville. Area citizens have also offered assistance however they could. At Miller, south of Harveyville, a men’s group at Miller Methodist Church plans to donate all of its proceeds from Saturday’s monthly breakfast fundraiser. According to one of the men in the group, Nick Green, the breakfast Saturday collected more funds than any since the breakfast was started about six months ago. The group will donate about $5,500 of Saturday’s proceeds to the pastor of the Harveyville Methodist Church. Green said the breakfasts usually collect about $200 to $300 each month in freewill offerings. Lohr said Harveyville residents still need personal items and donations are still being accepted, but an email address has been set up for donors to contact before delivering items to Burlingame’s collection point. Donors are asked to email harveyvilledonations@gmail.com so that items can be matched with those who need them. The email address is also available for tornado victims to request needed items. The city of Harveyville has also established a website to provide information to residents, donors and volunteers - http://harveyvilletornado.com. The site is updated daily to provide the latest information. Lohr said donations can also be given through the United Way of the Flint Hills, with all of the collected funds going to Harveyville residents. Donations can be given through United Way’s website uwfh.org; donors should specify donations to Harveyville tornado relief. Volunteers are still needed also, Lohr said, but people with specialized skills and equipment are being sought first. Lohr said some administrative responsibilities such as organizing paperwork need to be filled, and volunteer groups will still be needed to help displaced homeowners to pack household items. Others could be utilized to assist team leaders. For residents, meals will still be offered this week in addition to availability of the Salvation Army canteen truck, which has sandwiches and drinks. Meals for lunch and dinner, organized by Chuck Kuntz, are served at Odd Fellows Rebekah Lodge, on Oak Street, behind Riggins Market. To volunteer or donate for the meals, contact Kuntz at (785) 589-2497. As of Tuesday, Lohr said the town looks remarkably different than the day after the storm hit. She said demolition and removal of some of the damaged homes have been completed, with others to be torn down this week.